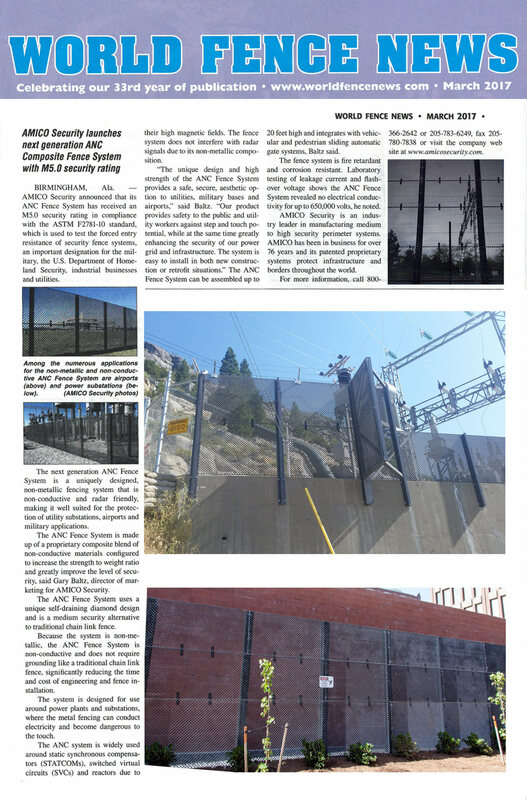 AMICO Security launches next generation ANC Composite Fence System with M5.0 security rating. Birmingham, Ala. — AMICO Security announced that its ANC Fence System has received an M5.0 security rating in compliance with the ASTM F22781-10 standard, which is used to test the forced entry resistance of security fence systems, an important designation for the military, the U.S. Department of Homeland Security, industrial businesses and utilities. 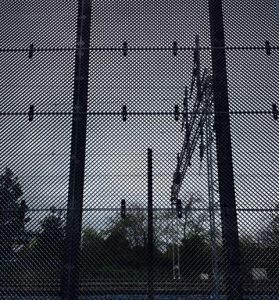 The next generation ANC Fence System is a uniquely designed, non-metallic fencing system that is non-conductive and radar friendly, making it well suited for the protection of utility substations, airports, and military applications. The ANC Fence System is made up of proprietary composite blend of non-conductive materials configured to increase the strength to weight ratio and greatly improve the level of security, said Gary Baltz, director of marketing for AMICO Security. The ANC fence system uses a unique self-draining diamond design and is a medium security alternative to traditional chain link fence. Because the system is non-metallic, the ANC Fence System is non-conductive and does not require grounding like a traditional chain link fence, significantly reducing the time and cost of engineering and fence installation. The system is designed for use around power plants and substations, where the metal fencing can conduct electricity and become dangerous to the touch. The ANC system is widely used around static synchronous compensators (STATCOMs), switched virtual circuits (SVCs) and reactors due to their high magnetic fields. 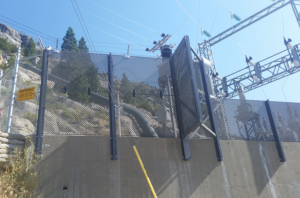 The fence system does not interfere with radar signals due to its non-metallic composition. ANC Fence System can be assembled up to 20 feet high an integrates with vehicular and pedestrian sliding automatic gate systems, Baltz said. The fence system is fire retardant and corrosion resistant. Laboratory testing of leakage current and flashover voltage shows the ANC Fence System revealed no electrical conductivity for up to 650,00 volts, he noted. AMICO Security is an industry leader in manufacturing medium to high-security perimeter systems. AMICO has been in business for over 76 years and its patented proprietary systems protect infrastructure and borders throughout the world. This article originally posted on WorldFenceNews.com.